The LX521 is a full scale DIY speaker design from Siegfried Linkwitz of Linkwitz Lab. Also see the more compact LXmini Speaker Kit. Madisound is offering the drivers at a discount off the regular price. Please note: Purchase of the LX521 construction plans is required and available here. "For many years now I have refined, lived with and enjoyed the ORION (2002) and PLUTO (2005) loudspeakers. I have learned that the loudspeaker's radiation pattern and placement in the room are more important than the acoustics of the room. Ever since I started building loudspeakers with cone-type drivers on open baffles several decades ago, I tried to find the optimum shape for those baffles given the drivers available. For ORION the drivers were selected primarily for their volume displacement and low distortion capabilities when used in a 3-way, active system. 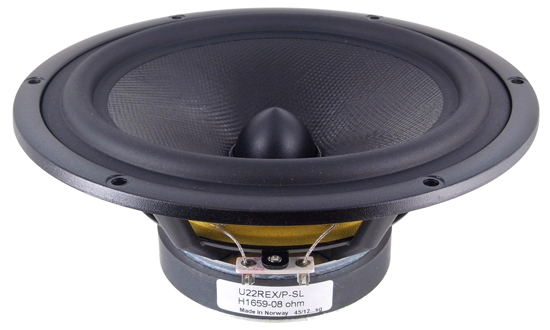 The LX521 evolved from experimentation with minimal width baffles, which can provide a more uniform dipolar radiation pattern at higher frequencies, if also suitable drivers are available. Inevitably this leads to a 4-way design, which I mostly tried to avoid in the past. The shape of the midrange/tweeter baffle was arrived at empirically for the chosen SEAS drivers and after many acoustic free-field measurements. The two SEAS woofer drivers are housed in a V-frame baffle, which exhibits reduced resonance above the operating range of the woofer and some force cancellation. A bridge over the woofer isolates the midrange/tweeter baffle from woofer cabinet vibrations. Woofer and midrange/tweeter baffles can be angled independently from each other. The bridge could also be built taller and the midrange/tweeter baffle tilted downwards to aim at the listener in front of a mixing desk. The woofer baffle must rest on the floor for ground plane reinforcement of its output. The LX521 Analog Signal Processor splits the broadband line level input signal into woofer, mid and tweeter frequency bands. It equalizes driver and baffle response for each channel and filters it with LR4 response. The midrange signal is split after the power amplifier by a passive crossover filter into lower mid and upper mid driver inputs. Frequency response on upper midrange axis and horizontal dipolar response in the frontal hemisphere are designed for neutral timbre of the the stereo phantom scene, when the loudspeakers are placed in the room as suggested. The aural scene is rendered with clarity and detail, both spatially and tonally." Full documentation on the LX521 can be found on the Linkwitz Lab website. I made these speaker for my recording studio as the main studio monitors. Listening to reference CDs, I've noticed that well recorded and mixed music sounds incredible on these speakers. Lyle Lovett's "North Dakota" for example, will remind you why you fell in love with music in the first place. Another favorite of mine on these speakers are anything by Switchfoot. On the other hand, pop music and mixes that are more one-dimensional are easy to discern from really well done mixes. It's not that they sound bad, it's just that they don't sound amazing. When I mix on these speakers, I must remind myself to try for "amazing" because it's really easy to make things just sound "good". I feel that my mix translation has vastly improved.